When the 2015 Ford Mustang EcoBoost was introduced with a fuel-sipping turbocharged 4-cylinder engine, it allowed the Motor Company to post their claim as offering the most fuel efficient muscle car in America. However, the tuning market saw a very different beauty in this new 2.3L turbo engine. With Ford focusing heavily on making the EcoBoost Mustang as fuel efficient as possible, it was expected that more power could be squeezed out of the tiny engine so as soon as the first new Mustangs hit the street – shops were working to see how much extra power they get out of this turbocharged engine. 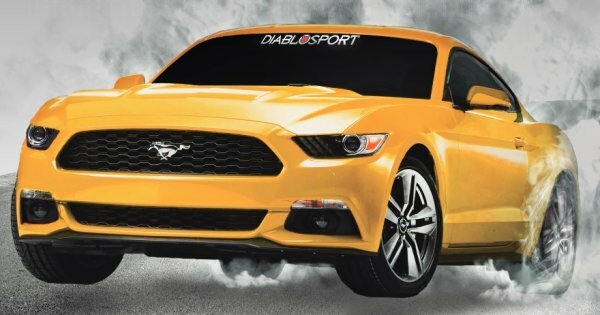 While some other tuning companies made the move to be the first to market with their products for the 2015 Ford Mustang, the folks at Diablosport have just introduced their tuning package for the EcoBoost Mustang and the numbers are impressive. The 2015 Ford Mustang EcoBoost in stock form offers advertised figures of 310 horsepower and 320lb-ft of torque, and while the rear wheel power can vary depending on a handful of conditions, EcoBoost Mustang owners can expect to enjoy around 240 horsepower and around 300lb-ft of torque where the rubber meets the road. However, those EcoBoost Mustang owners who want more punch from their new pony car can turn to the folks at Diablosport for more power and a variety of other improvements. First of all, the Diablosport tuning package includes three options for the 2015 Ford Mustang EcoBoost – the Factory HP tune, the 91 Octane Performance tune and the 93 Octane Performance tune. The Factory HP tune doesn’t improve the horsepower output, but it does sharpen throttle response, adjust shift points in automatic transmission cars and increase the rev limiter to make the most from the stock power. The 91 Octane Performance tune adjusts a variety of engine parameters including fuel flow and spark timing to increase the power of the 2015 Mustang EcoBoost. In addition to improving throttle response and shift points, the 91 Octane tune adds 28 horsepower and 48lb-ft of torque at the rear wheels. The 93 Octane Performance tune builds on the 91 tune, pushing those adjustable parameters a little higher to make the most of the higher octane fuel. As a result, Diablosport is able to make 30 horsepower and 55lb-ft of torque over the stock rear wheel power figures. Diablosport’s official power numbers for the EcoBoost Mustang tuned for 93 octane are 268.9 horsepower and 348.8lb-ft of torque. In addition to adding power and sharpening up the shift points and throttle response of the 2015 Ford Mustang EcoBoost, the Diablosport tuning package allows drivers to adjust other aspects of the vehicle. The package can make adjustments to the speedometer to account for different rear end gear ratios or different tire sizes, it affords you manual control of the cooling fan, you can raise the speed limiter, you can adjust the idle RPM, you can make adjustments to the cam timing and you can adjust the air/fuel parameters as part of the performance tuning packages. The Diablosport tuning package for the 2015 Ford Mustang EcoBoost is available via the Diablosport Trinity or Diablosport inTune units, with the price ranging from $389 to $599 depending on the unit chosen. Will these tunes void the warrenty?